Beaver Falls, PA—Geneva College is excited to announce that it will be adding men’s volleyball to its list of varsity sports beginning in the spring of 2019. With the addition of men’s volleyball, Geneva will now offer 17 athletic programs competing at the NCAA Division III level. Geneva will be joining the Allegheny Mountain Collegiate Conference (AMCC) as an affiliate member, as the Presidents’ Athletic Conference does not offer competition in men’s volleyball. The Golden Tornadoes will be joining the AMCC along with Hiram College, Thiel College and Wittenberg University. These four schools will combine with existing AMCC men’s volleyball member schools D’Youville College, Medaille College, Penn State Altoona and Penn State Behrend to form an eight-team conference. With eight members now in the conference, the AMCC will be eligible to receive an automatic bid to the NCAA Division III national tournament. There is a two-year NCAA-mandated waiting period to become eligible for that automatic bid, so until the 2020-21 season arrives, the eight schools will compete for a conference title in a post-season tournament following a double round robin regular season, vying for a Pool C bid in the national tournament. Geneva has fielded a very strong club team in recent years, having tremendous success at the national tournament against club teams from some of the biggest NCAA Division I schools in the country. 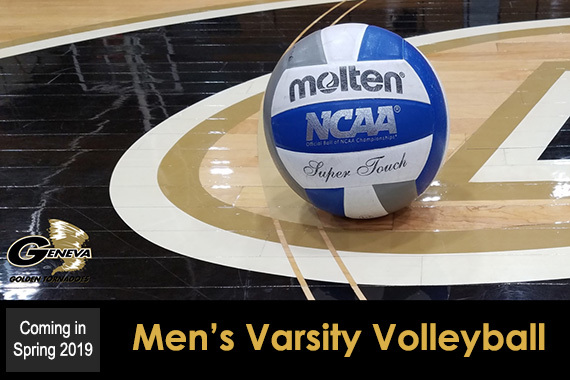 The 2018-2019 season will mark the first time Geneva’s men’s volleyball program has competed at the varsity level. Geneva expects to have a full time coach hired by June 1.